This is a shot that I wanted to redo after doing a pano of it in 2005 and having it in hospitals and private collections all over. But I shot it as a horizontal back then and was never completely happy with not having it as a vertical pano. So…on this trip to Paris and Greece, I knew I had to try again and see. But with the ridiculous crowds at sunset, having no one in the shot is wishful thinking as the hoards of people come from all over the island to watch the sunset at this spot – which happens to be the most beautiful spot on Earth that I have ever been to. Nothing even comes close to this eye candy and on this morning, I woke to the most beautiful clouds but heavy wind and cold. I knew that hardly anyone would be out, especially at sunrise, so I jammed on my 4-wheeler with my backpack and RRS gear and got to my favorite spot just in the nick of time. I set up my BH-40 ballhead with your panning clamp, which has been a lifesaver this trip, and shot 6 verticals – no HDR…just 6 shots – and stitched them together with Photomerge. I absolutely love it and wanted you to see how much your gear means to me!! Without the right gear, you just can’t work the right way. Traveling all over the world to shoot travel means you need the best gear that is more than dependable – the design is the key. Man, you all just do it right! A big thanks as you all helped me once again get the shot! Scott Stulberg is a long-time Really Right Stuff user who travels the world in search of beautiful sights to capture. Copyright ©2013 Scott Stulberg. All rights reserved. What a shot! Time and time again, I see how some images are created accomplished only after multiple tries and perhaps many trips over several years. The striking architecture and vibrant colors of the town are so nicely accentuated by the incredible sunrise. This would be a fantastic gallery image. Thank you so much for sharing. Joe Sr. 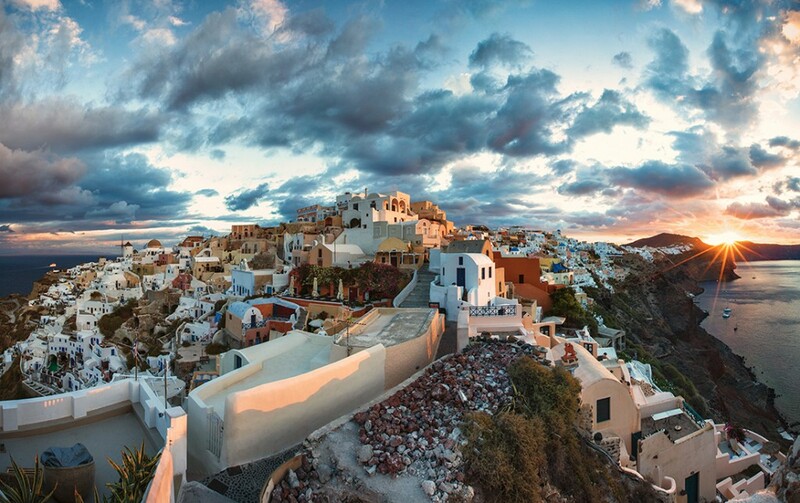 Thank you so much for commenting on my Santorini Sunrise. And yes, sometimes, you need to go back to try and improve what you have tried in the past as subsequent trips might afford you just what you envisioned. This was one of those times when it was worth the time and effort…and expense, as I have always loved this spot on Santorini. What was great was that I had to figure out a new way to capture it as sunset had hordes of people as usual, that would have ruined the shot. Taking a chance at sunrise proved the right recipe. Thanx so much Joe for having it posted on your site. As always, it is your incredible vision year after year that makes the best gear in the world for people like me that need the best out in the field! You make our job so much easier! All of you at RRS are amazing!! An amazing taken, thanks for showing us. Wonderful shot on every level! Always enjoy your work. Wonderful! And thank you for telling us about it – I love when a pictures gives me a feel for a place (especially one I haven’t been to!) and your picture and description have made this very real.. I love this shot and have been to Santorini. Simply gorgeous island. Is this shot available on any art website for purchase?